Amber Brannon designed these business cards for Teresa White, a life & business coach. “Teresa works with high level female entrepreneurs in the Nashville area. She has a very spunky, stylish and upbeat attitude towards life – so we created a brand that represented her personality while also radiating professionalism and success!” Amber said. These cards were printed by 4Over using smooth paper. “As a branding agency, we are able to partner with 4over to do wholesale printing with them. 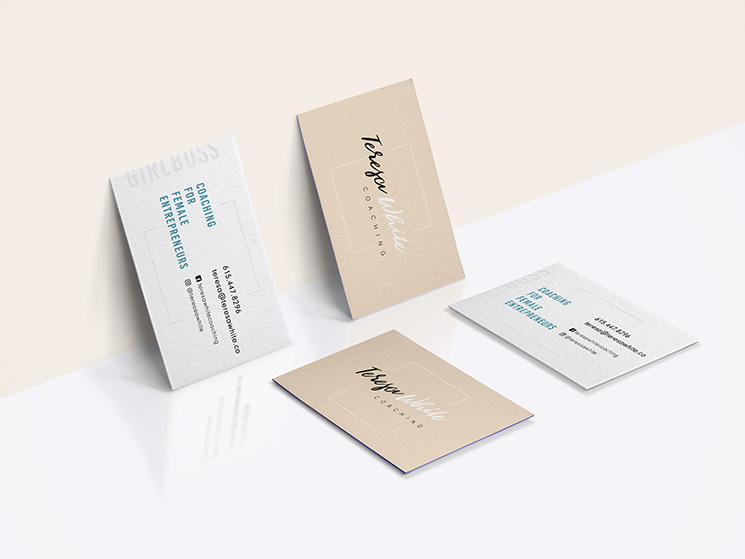 We used a smooth paper to give potential clients a texture to feel, interact with, and write on as Teresa is passing out her cards.” Amber added. This is a well-designed business card with a feminine touch and a lasting impression!